For their outstanding performance at the European Championships in Glasgow, RRI has designated rowers Mǎdǎlina Bereş and Denisa Tîlvescu “Athletes of the Week”. 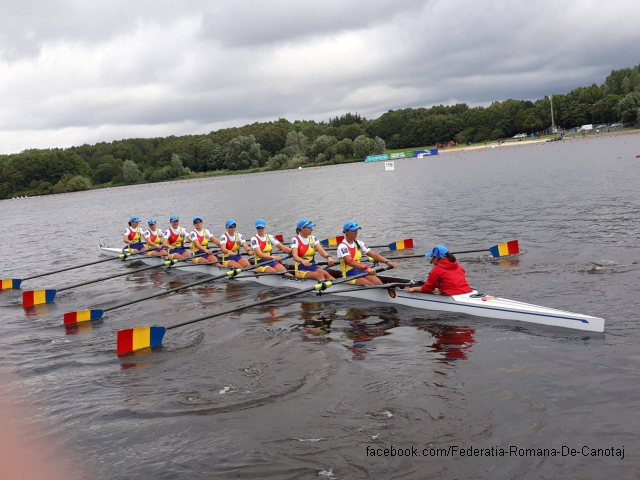 Romania took top spot at the European Rowing Championships in Glasgow at the weekend, topping the medals table with 7 medals: three gold, two silver and two bronze. Ranking second is France, with two gold, two silver and one bronze. The women’s coxless pair, the women’s eight and the men’s coxless four won gold medals. Stepping onto the second step of the podium were the men’s double sculls and women’s coxless four crews. The men’s eight and coxless pair won bronze medals. Of all the Romanian athletes who represented Romania in Scotland, two rowers stood out in particular: Mǎdǎlina Bereş and Denisa Tîlvescu. They won gold both in the women’s coxless pair and women’s eight races. For their outstanding performance, Radio Romania International has designated Mǎdǎlina Bereş and Denisa Tîlvescu “Athletes of the Week”. Mǎdǎlina Bereş is 25 years old. She was born in the commune of Mogoşeşti – Siret, in Iasi county, north-eastern Romania. She put up a notable performance in the women’s coxless pair and women’s eight races. In the women’s pair race at the European Championships, she won bronze in 2016, in Brandenburg, Germany, then gold in 2017, in Račice, the Czech Republic, alongside Laura Oprea. In 2015, at the European Championships in Poznan, she was a member of the women’s eight crew who got the bronze medals, just like at the Rio Olympics, in 2016. In 2017, the same crew won gold medals at the European Championships in the Czech Republic in Račice, and at the World Championsips in Sarasota, Florida, the USA. Denisa Tîlvescu was born on August 13, 1996, in Târgu Jiu. So far, she has stood out only in the women’s eight event, winning bronze at the European Championships in Poznan, gold in Račice, and grabbing the world title in Sarasota.